Added more volumetrics and went for another color tone. I didnt go to far I hope. My eyes are tired and it´s time to sleep. Back from holidays. One more with some tweaks. Meteoro - Nice job! If you’re still doing tweaks the penumbra color on the shadow looks a bit too saturated, and the lightbulb texture doesn’t work, other than that it’s a really solid scene. Chrisdc - That’s a good scene. Maybe some areas, especially the screen-left walls of the archways, look completely flat. If you can put in more variety (shadows, gradients) then the spaces will read better. The same goes with the specular stripes along each plank of wood as they approach the wall, or anything else that’s overly consistent. hardwork - That’s terrific! Congratulations! I really like the darkness and the contrast. The view out the window is perfect, too, you don’t really know what it is but it fits in perfectly. If you change anything, I’d say you could make the creature read a little better. For example, the parts of the tenticles that cross into the window light don’t look any brighter than the parts that disappear into the dark at the bottom of frame, maybe if they could get a nice wet-looking sheen where the light hits them, just some nice specular or rim light that glints off in a few places, it would feel more present in the room. Also, the idea that the creature itself is turning off the light doesn’t totally read yet because there isn’t enough light to show the tenticle hitting the light switch. Maybe just moving the window light which now hits the left side wall over to the right side instead would help bring enough attention to that area, or you could add a glint or rim to the tenticle tip and switch? 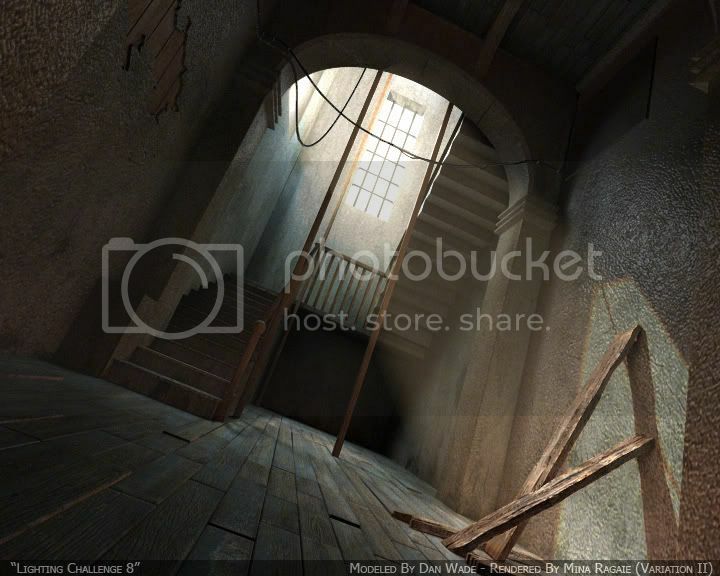 the columns along the left and right side of the image look a bit fake and probably need a different texture, and the stairs also could look more like wood I think. I also tried a sepia tone, check it out here. -Jeremy, did you say something about being “addicted to color”?? So, everyone… wich is your favorite?? Can’t any of you post the actual scene files? While it’s nice to look at the pictures I thought the whole purpose of these thing’s is for people to learn. You don’t have to include textures, just the lighting setup and various other settings. Come on you got the scene file for free, it’s just a few light’s and a few attributes. i don’t like a lot this camera drunk ,but i prefer the first pic ,very nice light . Thanks a very lot jeremy, that’s totally cool comments. I’ll make these updates (specu and change the ligth near the button) as soon as I can. hello MinaRagaie, like jah800, it’s the first one that I prefer, I really like the specular on the right wall, and the texture of the ground is very precise, love it ! Should be said that RenderMan is as good as the production house it´s in. I like your texture on the walls that’s original, and there’s a good definition, maybe some repeating thing’s on the left corner. The light is realy great too, the daylight is here very present. 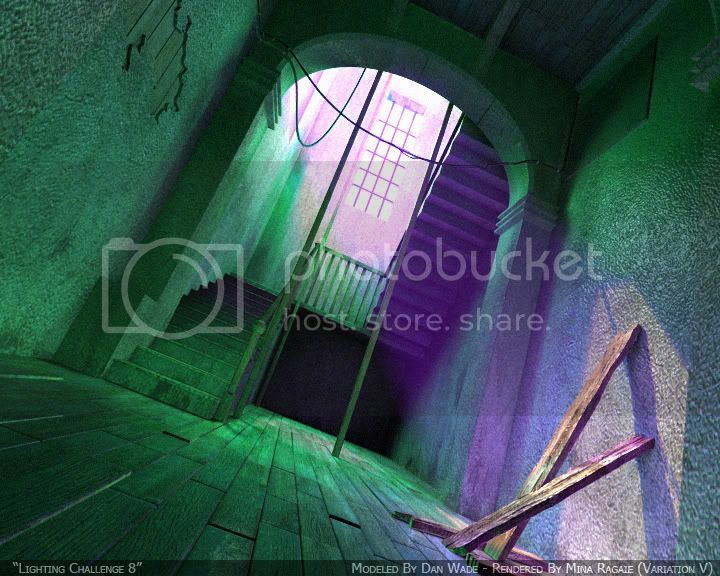 I don’t know about the 3DSmax scene I used maya’s one but had also some strange geometry. Just delete them, don’t worry:). Thanks for your input Jeremy. I remodeled the ligthbulb. Let me know what you think. btw, i finally got from amazon your book yesterday, I’m really enjoying it so far. Hi nice to meet you! Here is my render. I’ve created some play of light with the volume light. For this lighting I have use only scanline and a bit of post processing with Photoshop for Glow and noise. Thanks very much for this challenge. Here is my last render in HiRes, with a better flesh material on the tentacles, and I also placed the red back light in the bulb, so now, the tentacle can really switch it off. The red light now hit the place where the switcher is. I think that will be be my last try, played enought with it, and learned a LOT. Thanks very much for this challenge. Jeremy’s book, Digital Lighting and Rendering. I would really like to improve in this area, so any feedback would be great. My scene is being lit from the moon outside the window of an old barn. I have used three directional lights for the moon light and five bounce lights with depth map shadows for the ambient indirect illumination. hardwork - I guess hardwork has paidoff! Congratulations! I feel like making a gallery for this challenge now! Neo-x - Good start, see if you can figure out what’s making some of the surfaces look so bright; maybe some of the wood is actually reflective?? Meteoro - Nice job! I guess the lightbulb still looks strange but I guess if people really look at it they’ll figure out that it’s supposed to be a broken bulb. MinaRagaie - I think the top priority is not color changes but cleaning up the lighting. The false-colored edge to the sunbeam from the window doesn’t look right. If it happened on just one side, like only on the left, then it would look like chromatic aberration from the edge of the window glass, but having it uniform around the top and sides looks weird. Also the glow along the top of the upper right wall seems out of place, it should get darker there not brighter. If you found some colors you really liked during your compositing, maybe you could take those back into your 3D software and color the lights based on the comp and render with those colors for real?